Having avoided thesis-writing by setting up a comedy club in Southampton, when the PhD was finally over (despite these monumental efforts of procrastination) that very comedy club asked me back! Finding the funnies in life post-thesis, working in Public Engagement full-time and fond memories of Cryogenic adventures (which did NOT include freezing dead people). As well as at Bright Club, this set was also performed at Salisbury Café Scientifique in a Bright Club takeover. In 2017 I accidentally went on tour! Cafés Scientifiques, Skeptics in the Pub and rounding off with a U3A - turns out cold things are quite popular (because they're so cool...) The talked evolved along the way, incorporating questions from the fantastic audiences, but here is the gist of it and the latest slides are attached! "Cryogenics typically works with liquid nitrogen (-196 degrees C or 77 K) and liquid helium (-268.8 degrees C or 4.2 K). Down at these temperatures, all sorts of unusual things can happen - electrical resistance can disappear, almost anything, from frogs to surfers, can levitate, liquid can climb out of its container, biological processes can be slowed almost to a halt. With some deft application of science, some clever calculations and some ingenious engineering, all of this is possible and more - yet for some reason, whenever you say you work in cryogenics, the first thing people ask is, "Do you freeze dead people? Or aliens?" Join us to uncover some of the incredible things that cryogenics can do - and already has done - for you. We won't be freezing any dead people but we will explain why it's currently not a particularly sensible idea - and we may freeze an alien or two..."
How do you make the perfect cup of tea? It’s a question that’s been debated for hundreds of years on our humble Isle (and for much longer elsewhere!) – from the court of Princess Catherine of Braganza of Portugal who first introduced it to the British Isles, to George Orwell in his essay ‘A Nice Cup of Tea’ to present day #sciroom fans – everyone has an opinion on the nation’s favourite brew! But what’s the science behind it all? ... and how timing and temperature can affect the caffeine content and taste of a good cup of tea. All was discussed creatively with Play-Doh, paper, pens, and of course a cuppa! Over 100 years ago in Holland, a scientist (Heike Kamerlingh Onnes) designed a way to turn helium gas into a liquid – and the temperature of the liquid dropped to -269 degrees C i.e. very, very, very cold: a Cryogenic temperature. He then designed more experiments to find out what happened when he put things in this liquid and made them very, very, very cold too. In 1911 one of these things was mercury and what happened was magical: it could conduct electricity without any resistance! It was a Superconductor. Modern superconductors can be cooled with liquid nitrogen (at -196 degrees C) as can lots of other things, including sausages, bananas, flowers, tennis balls, school students (only joking!) and more. Using such items and lots of liquid nitrogen, various aspects of science and engineering, from material properties to engineering design, as well as the uses of cryogenics, were explained and explored via exciting demonstrations topped off with the ever-popular levitating magnet demonstration. The demonstrations were preceeded with a look at some amazing female scientists & engineers throughout history (my STEM Heroes). Continuing from her Bright Club set at the inaugural Bright Club Southampton (note the 'subtle' advertising), Jess couldn't resist the invitation to join in on another of Steve Cross's projects 'Science Show Off' when it came to nearby Winchester. Carrying on the story of a cryogenic engineer struggling to write her thesis she now recounts life surrounded by social sciences earning some much needed dosh managing a the public engagement project 'Talk to US! ', also at the University of Southampton while the mission to write continues! Following on from their successful live story-telling event at the Songbird Café, Bitterne, the Touch Network gave us the chance to share stories from the PhD journey at Portwood's friendly Coffee #1 café. What is/was the most surprising thing that has happened since you started a PhD? What unexpected places did it take you too? Have you ever found yourself in an unusual or amusing situation or in conversation with someone you never imagined you'd meet? Facing the unpredictable and the learning from the unknown are a big part of the journey to being called 'Dr.'. Current postgraduate research students (PGRs), recent graduates, early career researchers (ECRs) and academics alike were invited to share their experiences in a unique live story-telling event as part of the University of Southampton's Festival of Doctoral Research – all were welcome! Touch is a truly unique project and it was a real privilege to be collaborating with them. Emily Matthews and Sean Matthews - The challenges of completing a PhD, getting married and moving house all at the same time! Clare Gerrard - Overcoming mental health struggles, the thesis journey and setting up the social enterprise 'Embodied'. Jess Spurrell (me!) - Dealing with the problems you never knew you'd have to face such as working with the unknown, the loneliness of writing a thesis and finding yourself in unexpected situations! Thomas Richardson - Working as an NHS clinical psychologist while dealing with your own mental health problems - is there something to be said for 'you don't have to be crazy to work here but it helps'? What can Cryogenics and Superconductivity do for you? •	Cryogenics – more than freezing aliens? •	Superconductivity – the superpower of our generation? •	Supergrids, smartgrids, microgrids – what will the power transmission network of the future look like? •	What can we learn from the technology used at the CERN Large Hadron Collider? 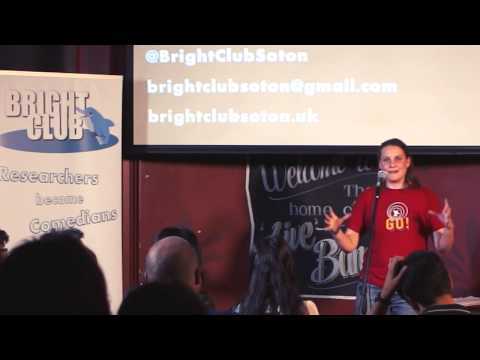 Cryogenics researcher Jess Spurrell performing stand-up inspired by research at Southampton's first Bright Club. Over 40 public engagement and outreach talks, workshops and demonstrations throughout the UK including Winchester and Brighton Science Festivals, the Big Bang Birmingham, BBC Stargazing Live Portsmouth and work with Out of this World Learning. Founding member of Bright Club Southampton and accidental performer at first ever event! Project Manager of the RCUK-funded School-University Partnership Initiative (SUPI) public engagement project Talk to US! hosted by the University of Southampton Education School. School-University Partnership Officer at the University of Southampton (continuation of SUPI PM role). Proud and active supporter of Ada Lovelace Day, International Women's Week and National Women in Engineering Day events. Curator of celebratory blog shouting out for unsung heroes!